Host your event in our beautiful gallery featuring an ever-changing display of original artwork in a contemporary setting. 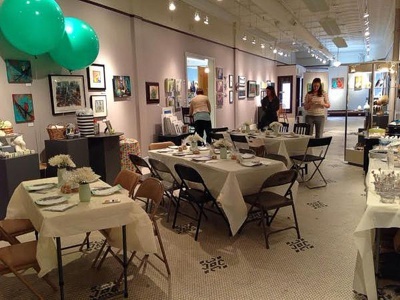 Artists’ Own is a unique and fresh alternative venue for small receptions, baby or bridal showers, birthdays, and more. 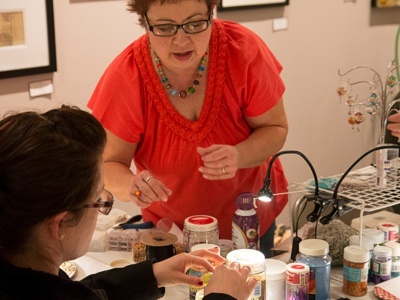 Some of our members offer workshops or demonstrations. Call or stop by to inquire about possibilities. All bookings are subject to availability and gallery discretion. $50.00 deposit upon booking, non-refundable; balance due day of event. If alcohol is served, a licensed bartender must be present. For the protection of the art, it may not be moved or rearranged unless by an Artists’ Own member. Client is responsible for artwork breakage. We look forward to discussing your special event with you.